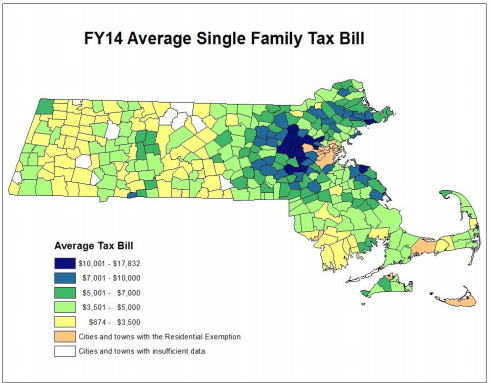 The average single-family property tax bill in Massachusetts is now $5,044, an increase of 11% since 2011, according to a recent report conducted by the Massachusetts Department of Revenue. 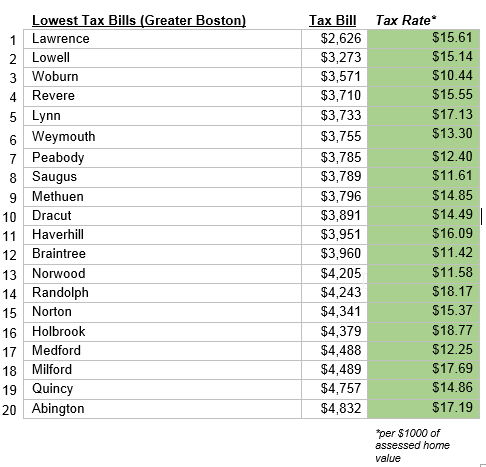 The average tax rate in Massachusetts is now $14.91 for every $1,000 in assessed property value. Towns and cities with the highest tax rates are not necessarily those with the highest tax bills. The assessed value of the homes is also part of the equation. The highest tax rate in the state goes to Longmeadow, a town near Springfield, which has an annual tax rate of $23.15, but the average home value is $326,483, putting the average tax bill at $7,558. As you can see from this map below, many areas surrounding Boston have tax bills above $7,000 a year. 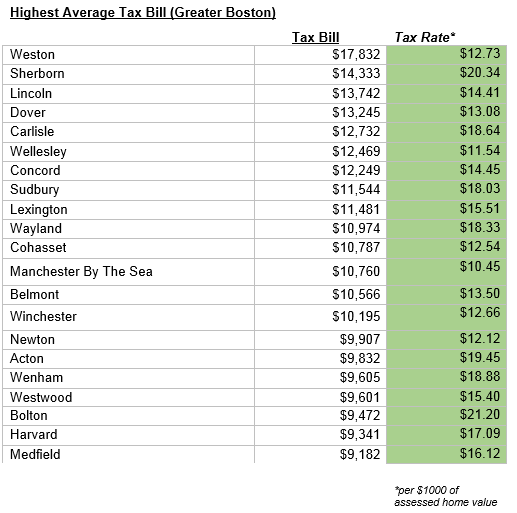 Most towns in western Massachusetts with assessed home values lower than the state average have the lowest tax bills in the state, such as the town of Hancock, with an average annual tax bill of just $674 and the average home value of $237,344. The town of Rowe, in northwestern Massachusetts near Vermont, has an annual tax bill of $1,170 and an average home value of $192,796. Towns in the Cape and the Islands have high property values yet very low tax rates and thus have relatively low tax bills. This is because many of these properties are vacation properties so they don’t require taxes to pay for services and amenities off-season. Thirteen cities and towns on this list don’t show average tax bill numbers because they have adopted a residential exemption, and detailed data used to determine their average tax bills is unavailable. They are: Barnstable, Boston, Brookline, Cambridge, Chelsea, Everett, Malden, Nantucket, Somerset, Somerville, Tisbury, Waltham and Watertown. The tax rates for these towns, however, are listed at the end of this article. The residential exemption is a dollar value that is exempt for taxation on a principal residence that you own. This exemption reduces the taxable valuation of a taxpayer’s principal residence. For instance, in Waltham, the residential exemption reduces the assessed value of a primary residence by $78,317. So a home in Waltham assessed at $450,000 would be taxed at the reduced valuation of $371,683. ** At the time DOR published these numbers, eleven communities (Athol, Chester, Conway, Egremont, Gosnold, Monroe, Orange, Oxford, Royalston, Russell, and Templeton) had not set FY2014 tax rates.